« Teaching our Daughters to be Healthy, Not Skinny! Are you Willing To Go the Distance as a Stepparent? My husband, Randy, and I leave tomorrow to travel to Little Rock to run the Little Rock marathon on Sunday. 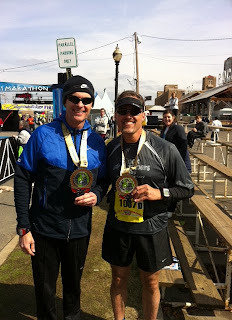 The picture below is after last year’s race – Randy is on the left. Randy posted a faster time last year than his previous four marathon events. On our way home from LR, we talked about how he improved his time. Many of his training methods relate to similar strategies we can use as stepparents. 1. If it isn’t working, try something different. Randy had struggled with leg cramps toward the end of each previous marathon race. This time, he sought help from a specialty running store and used some magnesium tablets that seem to have prevented the cramps, allowing him to decrease his walk breaks at the end of the race. If you’re struggling in a particular area of your stepparenting role and don’t know a solution, it may be time to seek help. Find a pastor, trusted friend or counselor who is familiar with stepfamily dynamics to confide in and seek advice. Check out coaching/counseling options that are offered through stepfamily sites (including mine here). 2. Be willing to invest a lot of time. Preparing to run 26.2 miles in a marathon is not an easy feat. The training schedule involves 18-22 weeks of strenuous running, along with other cross training workouts. Attempting to run a marathon without the training leads to failure. Successful stepparenting also involves a lot of time. Stepping into your stepchild’s life and expecting an instant relationship only leads to disappointment. Be willing to spend time getting to know your stepchild, understanding his likes/dislikes, and finding common ground on which to build a relationship. 3. Expect setbacks along the way. Long distance training often leads to injury. The workouts are hard and your body begins to break down. An unexpected weakness shows up through a muscle strain, bone fracture, or ligament tear. With adequate rest and therapy, injuries heal and the training can begin again. Stepparents can also expect setbacks. A difficult ex-spouse, rebellious teen-ager, or unexpected conflict can lead to setback. It may take months or years to work through a difficult phase, but progress can always begin again if you don’t give up. 4. The biggest prize comes at the end but there are rewards along the journey. The medal earned for completing a marathon is placed around the runner’s neck as he crosses the finish line. However, a sense of pride and satisfaction is enjoyed throughout the training period as a runner sets and reaches goals he never dreamed possible. The greatest reward for successful stepparenting is experienced as stepchildren leave home, appreciative of strong relationships they share with one another. However, stepparenting also has rewards throughout the journey as bonding occurs and love for one another develops. Successful stepparenting, like marathon training, has rewards worth seeking. But the journey to the finish line can also be cherished when you choose to keep going the distance, even when it’s not easy. How do you keep going as a stepparent when the road gets tough? Will you share? Gayla, This is a great post. Already at the other end of my step-parenting experience, I can say that even when it doesn’t look like the reward is there, it will be. I wasn’t sure if I’d made any impact on my step-son’s life until he graduated from high school. It was only then that our relationship really opened up. As I can now relate with him on an adult level, he now understands I had his best interests at heart all those years gone by. So if you are a step-parent wondering if your efforts today will be worth it tomorrow, take courage and keep forging toward that finish line. It’s worth every set-back, obstacle, and heartbreak. Thanks Alycia. You are so right – we usually don’t know the impact we’ve made with our stepchildren until they’re older. They have to get through the difficult adolescent years before they can began to understand we always had their best interests at heart. Thanks for sharing – you’re an encouragement to others!